Tomorrow--Saturday, February 28--is the 10th annual Open That Bottle Night. Each year, Dorothy J. Gaiter and John Brecher of The Wall Street Journal give us permission to open up those bottles that hang around our houses with all kinds of sentimental strings attached. Often, we hold on to them so long they're no longer drinkable. Today on Serious Grape, I talk about the event, my experiences with holding on too long to a special wine, talk a bit more about the philosophy behind the event, and give links to public and online OTBN celebrations you may want to participate in. What bottle do you have that you're afraid/unwilling to open? Tomorrow night's your chance! I'll have my OTBN tasting report up on Monday night, so check back here if you want to know what I opened up. 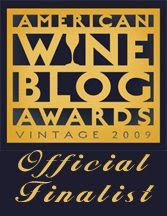 It's time to vote for your picks in the 2009 American Wine Blog Awards. Every year, all over the country, hundreds of devoted oenophiles put down their wine glasses long enough to turn on their computers and share their thoughts about wine. It's a labor of love. We all have full time jobs, but we blog because we think that bringing more voices into the national conversation about wine is a good thing. Tom Wark, from the blog Fermentation, organized the awards to bring attention to this large and growing phenomenon and to recognize dedication necessary to blog consistently and well over the course of a calendar year. This year, votes are being cast in the following categories: Best Writing, Best Graphics and Presentation, Best Single Subject Blog, Best Business/Industry Blog, Best Winery Blog, Best Wine Reviews on a Blog, and Best Overall Wine Blog. Many excellent, deserving blogs are on the list of finalists, and I encourage you to take a look at them all before making your final decision. Voting is open now through March 4 at 11:59 PM. Thanks once again to Tom for having a thick enough skin to organize and man these awards. And a big thanks to those of you who nominated GWU$20. I really appreciate your support and readership over in this corner of the wine blogosphere. We had a small but choice turnout for the February Wine Book Club. Kori from Wine Peeps and I are the devoted duo still doggedly reading wine books and reporting on them. This month we read the Kladstrups' Champagne: How the World's Most Glamorous Wine Triumphed Over War and Hard Times. This month, we were in agreement about the book, too. Kori knew what to expect, because she read the Kladstrups' other book Wine and War. She enjoyed the longer historical span that Champagne covered, as well as the focus on a single region. Kori also enjoyed having the myths surrounding Dom Perignon debunked and finding out about the real monk behind the myth. You can click here to read her complete review, with some of the book's more memorable quotes. We both agreed that the tales of the wine caves and how they served as bunker/employment center/hospital/school/opera house/ banquet facility for the region was astonishing. We also both agreed that Champagne was getting bumped up on our list of wine regions we simply must visit. The Kladstrups are very good and conveying the history and flavor of the area, and making the reader want to know more. In the end, both Kori and I recommend this book to anyone who likes history and Champagne. You'll get generous servings of both with this book. As regular readers know, pairing Indian food with an appropriate wine is something of an obsession of mine. And even though I love Gewurztraminer and Riesling, even I get tired of always pairing this flavorful and aromatic cuisine with these choices. I've just discovered another white wine that works with spicy Indian food: the 2007 Hayman & Hill Interchange. (MSRP $14; find out more information here about this relatively new release) This wine is ideal for pairing with Indian food, because it gives a slightly off-dry impression without being sweet. It also has a slightly heavier mouthfeel than Riesling or Gewurztraminer, so its ideal with richer curries like chicken korma, shrimp tikka masala, or lamb pasanda. The 2007 Hayman & Hill Interchange is a white blend made from 47% Chardonnay, 34% Sauvignon Blanc, 7% Muscat Canelli, 5% Malvasia Bianca, 4% Semillon, and 3% Gewurztraminer. The result is a wine with creamy, floral, and orchard fruit aromas. These are followed up with flavors of honey, peach, and a touch of smoke from the six months that the wine spent in small, French oak barrels. The combination of richness and freshness was interesting and appealing. We had the wine with creamy shrimp tikka masala, and it was perfect for the meal's combination of spicy, but rich, flavors. The sweet impression the wine gives meant it didn't clash or compete with the spices, and it also brought out the sweetness of the shellfish. And the heavier mouthfeel was a nice complement to the coconut milk in the sauce. I think this wine would be excellent with yellow Thai curry, or even a spicy General Tso's chicken because these dishes also combine spicy and sweet notes. Full Disclosure: I received this bottle as a sample. 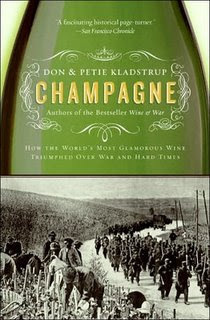 For the Wine Book Club's February read, we turned to Champagne--the world's favorite bubbly beverage--and Don and Petie Kladstrup's critically-acclaimed book, Champagne: How the World's Most Glamorous Wine Triumphed Over War and Hard Times. The book opens and closes with a trip to a battlefield. Don and Petie Kladstrup use these bookends to emphasize the fact that what is arguably the world's most glamorous wine comes from the same place on earth where a great deal of blood has been shed. These kinds of contrasts--between glamour and war, between the luxury-loving Louis XIV and the disheveled Dom Perignon, between the underground world of the Champagne region's wine caves (complete with banquets, cabaret, and opera) and the German bombardment taking place overhead--occur again and again in the Kladstrup's book. The result is a highly readable and engaging account not only of how Champagne got its elegant reputation, but how that reputation was zealously guarded. Champagne is not a chronological trot through the history of the beverage or the region--although the authors do follow a rough chronological framework. Instead, it reads a bit like you're accompanying the Kladstrups on a saunter around town. Along the way you meet some interesting people, learn some history, and visit some beautiful places. The Kladstrups are excellent tour guides, and clearly know their subject inside and out. While the book is wide-ranging, it focuses on both the wine of the region and the period of the Great War--or World War I as its called in America. Maybe I'm having a hard time taking off my history hat, but I sometimes found all the jumping around from place to place and time to time a bit exasperating. It wasn't that I couldn't follow the Kladstrups--they write well, and the stories they tell are interesting. But I sometimes felt as though I just wanted them to tell the story simply, from beginning to end, and be done with it. Despite my occasional moments of frustration, the book includes enough riveting detail and compelling story-telling to more than make up for a few rambling moments. What I will most remember from this book, for instance, are the accounts of life in the region's caves or crayeres during the Great War. The pictures were amazing. Seeing entire schools, bedrooms, banquets, hospitals in the caves was something else, and drove home the Kladstrups' point that Champagne, for all its elegance, is made from soil on which hundreds of battles have been fought. Reading the Kladstrups' book made me want to visit Champagne myself and explore the region, its wine, and its history. I'd recommend this book to armchair travelers, World War I buffs, and anyone who truly loves the wines of Champagne. I'll be back on Thursday with the wrap-up, so if you have a review to share, please send me a link or put the link in the comments here or on the announcement post. I'm still learning about Italian wine, but when I think red wine from the Veneto I think Valpolicella or Amarone. Made primarily with local grapes Corvina Veronese and Rondinelli, these can be zesty and fresh or full-bodied and silky. When I looked through my cellars for a Venetian red, however, I came across a bottle that seemed more like a Bordeaux. It was made from Cabernet Franc and Merlot. Cab Franc and Merlot? Turns out Cabernet Franc is popular in the Veneto--and in nearby Friuli-Venezia Giulia, too. And Merlot, which was probably introduced into Italy at the end of the 19th century, is the 3rd most heavily-planted grape in all of Italy. After drinking this bottle, I can see why. 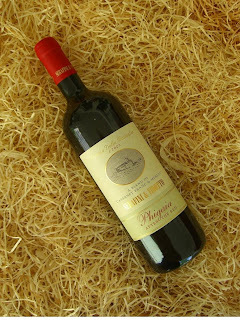 The 2002 Serafini & Vidotto Phigaia "After the Red" was hands down an excellent QPR bottle of wine that cost less than $10. ($9.99, Garagiste; the 2004 is available elsewhere for around $20) Expressive aromas of greens, leaves, and a bit of red fruit were accompanied at first by a whiff of something that reminded me a bit of melamine. Happily, that blew off very quickly. The flavors were the real treat, with subtle layers of cranberry, then plum, followed by herbs, some leather, and a bit of tobacco. This complex wine was not the least bit intimidating, given its price tag and its gently unfolding flavors. It was a wine that rewarded active attention as it developed, but didn't demand you stop everything and take notice. We paired the wine with a take-out pizza loaded with sausage and green peppers and the wine was the perfect backdrop to the herbal, green pepper, and fennel flavors of the pie. This bottle was just the latest reminder of something I've felt with increasing conviction over the past 15 months as I've been drinking my way through the Italian peninsula: there are treasures to be had here--and some of them are quite inexpensive. Tuscan and Piedmont wines are great. I love them. But there's so much more to Italian wine, such as this unexpected Bordeaux blend from the Veneto. I got a present in the mail from my godmother last month: a wine book that she kept between 1970 and 1980 while living in Germany. What a treat! I loved reading over the labels and her notes. My favorite: "Lancers is always good." 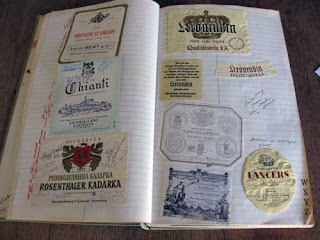 You can read about my experiences with my aunt's wine scrapbook in this week's Serious Grape column on Serious Eats. Are you preserving your wine memories for future years? If so, how? There is no meal idea greeted more warmly in my house than "Steak House at Our House." For a fraction of the cost involved in going out to a nice steakhouse, you can have a splendid feast at home. And of course nothing goes as well with steak as a juicy, red wine. The Recipe: this is less a recipe than a list of shopping suggestions, which you should scale according to how many people will be joining you for dinner. Steak--about 6 oz per person. We prefer New York cuts or rib eyes, but whatever you like to eat is of course fine. Grilled, broiled, or pan-fried, the steak will make the most carnivorous guests happy. Potatoes--we either eat a baked potato, done properly, in the oven with sour cream and chives, or I heat up some frozen Alexia Sweet Potato Fries. It is a draw in our house which is better, although at the moment the verdict is tipping towards the fries. Sides--this is really up to you but some of the sides we enjoy are sliced tomatoes and red onions sprinkled with some balsamic vinegar, olive oil, salt, and pepper; grilled asparagus; sauteed mushrooms; and green beans. Plan on at least one side, but two side dishes never seems to cause complaint. Salad--if ever there was a moment for iceberg lettuce, this is it. Serve wedges of iceberg lettuce and an appropriately 1970s salad dressing like Thousand Island, Blue Cheese, or Green Goddess. If you must be trendy, go with a simple toss of baby arugula with balsamic vinegar, olive oil, salt, and pepper. And if you really have to do it, Caesar Salad will also work but I think it's a bit much with everything else in this dinner. The Wine: Cabernet Sauvignon is the classic choice here, but it can be difficult to find a truly affordable Cabernet that is drinkable straight out of the bottle without any aging or fooling around with decanters. Instead, try a Cabernet Sauvignon blend like the 2006 Wolf Blass Shiraz-Cabernet (sample; available for $8-$14). When you blend some Syrah (43%) into the Cabernet (57%), you get a very good QPR wine that is lush and bright straight out of the bottle. This blend is distinctive for its pronounced aromas of eucalyptus, mint, and red fruits. The flavors are in the bright, red category (pomegranate and cranberry), accompanied by some chalky mineral notes. There is a freshly mint and herbal aftertaste. The wine will be perfect with the rich, full-bodied meat and the variety of side dishes that you prepare to go with it. Enjoy! Welcome to Wine Blogging Wednesday 54, the monthly online tasting event dreamed up many moons ago by Lenn Thompson of Lenndevours. This month our host is David McDuff, who blogs about food and wine at McDuff's Food and Wine Trail. For his theme he picked the wines of Italy's Piedmont region. 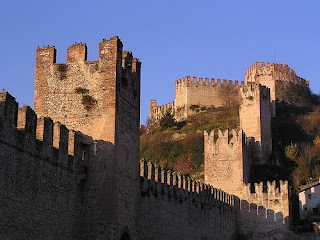 I was thrilled, since GWU$20 will be focusing on Piedmont as part of my ongoing Italian wine project, and this way I get to learn a lot from other wine bloggers before I start my own journey into the grapes of the region. Piedmont is second only to Tuscany in terms of its high international reputation among wine lovers, and many serious collectors prefer the wines of Piedmont because of their subtlety and finesse. Because wines from the Piedmont are coveted, they are also costly--but there are varieties (such as Barbera) that often make their way into less expensive bottlings. To get a sneak peak of what's in store for me next month, I looked through my cellar and found a bottle of Barbera, the Piedmont's fruity, drinkable grape. What I discovered was that the 2006 Stefano Farina Barbera d'Alba, was not so fruit-forward at this stage of its life. But perhaps it was the better for it. ($8.95, Chronicle Wine Cellar; available elsewhere for $9-$13). The wine had aromas of plum and tobacco, which already told me that this was going to be a wine that was better with food. The plums were present in the flavors, as well, and the tobacco turned towards something more reminiscent of black tea. 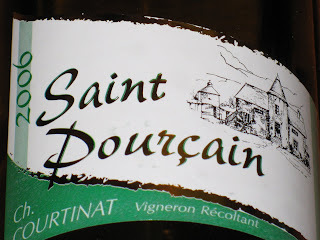 There was abundant acidity at the center of the wine, and an herbal, plummy aftertaste. Because of the wine's acidity and herbal, tobacco, and black tea flavors it was excellent with a tomatoey pasta dish, Strozzapreti with Tomato-Pancetta sauce. Accented by herbs and cheese, the dish really made the wine shine. Even better, it's quick to prepare so it's a perfect meal when you want something hot and comforting after a long day at work. Thanks to David for a great theme, and I look forward to reading everyone's posts about wines from the Piedmont. This month I actually managed to find a sparkling wine and a dessert wine to add to my tastings of wine from Italy's Veneto region. Though many Italian regions produce sweet wine, fewer produce sparklers. Though you might not know it, Prosecco--Italy's best known sparkling wine--is made in the Veneto. 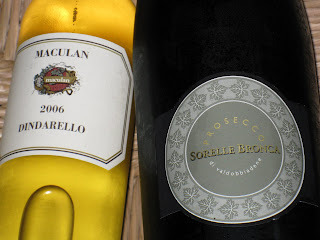 I wanted to try a Prosecco that I wasn't familiar with and selected the NV Sorelle Bronca Prosecco di Valdobbiadene (K&L Wines, $16.99; available elsewhere for $14-$17). Made by a pair of viticultural sisters, it was a clean, bright wine that was very pale in color. Aromas of lemon and lemon blossom made a fresh first impression, and the medium-large bead was equally refreshing. The emphasis in the flavors were lemon juice, with a touch of pink grapefruit. This was a simple, citrusy Prosecco and qualified as good QPR given its enjoyable freshness. In the sweet wine department, I tried the 2006 Maculan Dindarello (Bristol Farms, $21.99/375ml; available elsewhere for $15-$19) This was an absolutely delicious dessert wine made with Moscato grapes, its sweetness and acidity in excellent balance. There were aromas of orange peel and pineapple, and the flavors were equally tropical and full of pineapple. The aftertaste developed a touch of coconut and brown sugar in the juicy aftertaste. Excellent QPR for a wine that reminded me of Sauternes in both taste and texture. This year, one of my goals is to learn more about Washington wine. I'm starting my journey this month, and decided to take my first steps with a white wine. Washington may be better known for its Cabernet Sauvignons and Merlots, but it makes white wine, too. The climate seems especially well-suited to Rhone varietals and Riesling. It's been a while since I had a Riesling, so I picked the latter. The 2006 Long Shadows Poet's Leap Riesling was a very good QPR choice. ($20, Wild Walla Walla Wine Woman; available elsewhere for $17-$24) While higher in price than many domestic Rieslings, it has character and finesse. It comes from fruit grown in the Columbia Valley, which is Washington state's largest appellation. It includes within it six other smaller AVAs, and the most plentifully planted grapes are Merlot, Cabernet Sauvignon, and Chardonnay. Syrah and Riesling are also planted there in what qualifies (for Washington, anyway) as a "desert" climate of less rain and damp maritime influence. This excellent domestic Riesling had aromas of seaspray, apples, peaches, and a hint of petrol--kind of like driving through an oceanside fruit orchard in a beat-up pickup truck. There was a slight spritz on the palate, along with flavors of melon, peach, and apple. The wine's aftertaste was juicy and a touch off-dry. This wine receives consistently high reviews from wine critics, and sells out quickly (both the 2007 and 2006 bottles are already sold out at the winery) so if you see some, nab it. An aromatic, fruity, and flavorful wine such as this one is perfect with spicy Asian food. I made a doubtless inauthentic but extremely good stirfry of chicken, Chinese eggplant, oyster sauce, chiles, onion, garlic, and basil and it was delicious with the wine. The bottle's slight sweetness meant there was no acidic clash between the spices in the food and the fruitiness of the wine. I'm off to a good start with my Washington wine lessons. Next month--a red. Do you love red wine? Its a bit berry, a bit cherry, a bit mocha, a bit cocoa, a bit espresso--and a bit of an acquired taste. 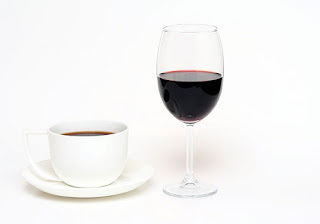 But I've never found a coffee lover who didn't also like this full-bodied, strongly flavored wine. I used to have a t-shirt that proclaimed "Coffee and Chocolate--Nature's Only Perfect Marriage." Needless to say, I love Pinotage. Click on over to the story and leave your thoughts about this grape. And if you've never had it, but can't get enough of the bitter, caffeinated brew in the morning you might enjoy switching to this wine in the evening. If you are looking for a special, affordable meal to share this weekend with the one you love, look no further. I've got the dinner and the wine for you. And if romance isn't in your plan for this weekend, save this combination for when it is. The Recipe: How does a pasta dish made with cream, vodka and smoked salmon sound? This recipe is fast, easy, and tastes like restaurant food in terms of sophistication and layers of flavor. With its eggs and cream it's not a dish if you're on a strict diet. But it is a good choice if you want to make something that is special and decadent. The Wine: To go with such a rich, creamy dish you'll want a wine with plenty of freshness and acidity. I thought I would color-coordinate it, too. We had this with the NV Mumm Napa Brut Rose (suggested retail $24; often available for $15-$20). This sparkling wine is a rosy salmon in color, and it looks perfect next to a plate of this pink-flecked pasta. Aromas of yeast, lemon peel, and under-ripe strawberries are fresh and inviting. In the flavor department, I was reminded of those tiny wild strawberries we picked as kids in that the strawberry here is not jammy but a bit tart. There is a nice, bitter note in the yeasty, doughy aftertaste. The bubbles are large and a bit rough without food, but they were a nice accent to this dish and helped to keep the overall meal light and lively on your tongue. An excellent QPR rose sparkler. Fast, easy, affordable, delicious, and decadent--this is a meal that is sure to get anyone to agree to be your Valentine. In your travels you might see wine labeled "Meritage" and wonder --not surprisingly -- just what it is. Meritage wines are California's answer to Bordeaux blends and to labeling restrictions that require at least 75% of a wine's juice come from a single grape (like Cabernet Sauvignon) in order that it be labeled Cabernet. In Bordeaux, however, where fabled and sought-after reds and whites are produced, the blend of juice in a wine is often much more even--say 60% Cabernet and 40% Merlot. These wines are simply labeled "Bordeaux" after the place they were made. 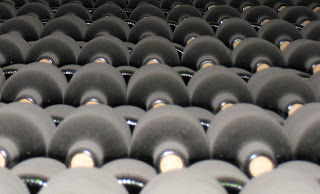 Here is the US, where bottles made with a single variety are the norm, consumers have sometimes looked askance at blended wines and assumed they represented lesser quality. Not so, says the Meritage Association, an organization founded in the US in 1988 to promote and produce blanded wines in the Bordeaux tradition. Blended wines can provide wine lovers with greater complexity, age-worthiness, and also a more affordable price--so what's not to like? I recently tried two very good QPR Meritage blends that I think warrant a second look if you are looking for an affordable red blend that will go well with winter foods such as soups, stews, casseroles, and roasts. 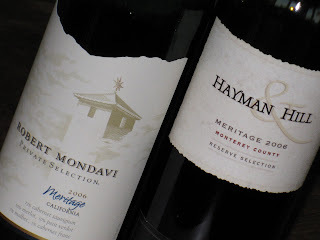 The 2006 Hayman & Hill Meritage Reserve, for example, is made from a blend of 43% Cabernet Sauvignon, 25% Merlot, 15% Malbec, 11% Petit Verdot, and 6% Cabernet Franc fruit from Monterey County. (sample; available from $12-$17) Upon first opening, I smelled the traditional Bordeaux aromas of cassis, plum and spice. Flavors of plum turned more towards cherry as you sipped, and there were some oaky notes and good acidity. Over time, with air, the flavors became much richer and plummier and developed milk chocolate notes. I would expect this wine to improve over the next 12-18 months, although it is delicious now. The 2006 Robert Mondavi Private Selection Meritage, on the other hand, is made with 72% Cabernet Sauvignon, 10% Merlot, 10% Petite Verdot, 7% Malbec, and 1% Cabernet Franc fruit from California. (sample; available for $8-$11). This is a very new release and was a bit hot upon first opening, but at 13.5% alc/vol I think this is a sign of youth. Once again I smelled the typical Bordeaux aromas of cassis and plum, and the flavors are dominated by rich plum. There are vanilla and mocha notes in the aftertaste which added complexity and contributed to the enjoyment of this easy-drinking red. If you haven't tried Meritage and like Cabernet Sauvignon or Merlot, you should give one of these blended reds a try. When I walked into Sherry-Lehmann Wine & Spirits recently, I wasn't sure if there would be much on the shelves that would be interesting and affordable, given its swishy location and upscale feeling. Instead, I had a terrific time shopping for some seriously good value wine in one of Manhattan's best neighborhoods. The service and the selection were outstanding, as well. Sherry-Lehmann, for those of you who don't know it, looks and feels like an exclusive wine boutique. There is warm wood paneling, tasteful displays of wine, and a bevvy of knowledgeable sales assistants to answer questions and help pull your order together. Instead of being intimidating, however, the store feels warm and welcoming--as if you've wandered into a wine library full of people who want you to find the perfect bottle for your needs. If your needs run to $3000 Armagnac, they have that. If, like me, your needs run to a wide variety of under $20 treats, they have that, too. In California, we don't always have the best selection of French regional wines at affordable prices so I made a beeline for those displays and quickly got lost browsing among the options. The store was crowded, but a member of the sales staff approached and asked if I needed help. I took them up on the offer. I was looking for all kinds of things--wine to go with Chinese takeout, sparkling wine, and affordable bottles of red and white wines for a big party--and we had dinner reservations. I could have spent all day there, but instead my friend and I who were selecting the wine went for a more efficient approach. The staff member grasped what we were looking for immediately after I squealed at seeing the 2006 Chateau Pesquie Cotes-du-Ventoux Cuvee des Terrasses for $12.95 a bottle. After putting four bottles on the order, she suggested a 2007 Sauvion Quincy "Les Glaneuses" ($14.95) for the party white that would go with the Ch. Pesquie. We also left with a bottle of 2007 Duboeuf Moulin-a-Vent Gamay ($13.95) and a 2006 Trimbach Gewurztraminer ($18.95) for the Chinese takeout. And for toasting? After discussing the pros and cons of various options we happily purchased several bottles of Louis Bouillot Cremant de Bourgone Rose Perle d'Aurore ($13.95). As a special treat I snagged a bottle of 2005 J. L. Chave St.-Joseph "Offerus" ($23.95). This staggeringly good selection of affordable wine was purchased after 7 pm on December 30--and I wanted it delivered the next day. That's right. New Year's Eve. Manhattan. All in less than 18 hours. The wine arrived, safely and on time, just as Sherry-Lehmann promised. In the end, I had to conclude that there is wine shopping and then there is Sherry-Lehmann. It was the most fun I've had buying wine in a long, long time--and it was a total delight to have a person helping me who really knew what she was doing and didn't try to sell me a single inappropriate or overly expensive bottle of wine. There's just one problem. Sherry-Lehmann is in NYC and I'm on the other side of the country. Any chance you'd open a branch in LA? If This is Soave, What Have I Been Drinking? 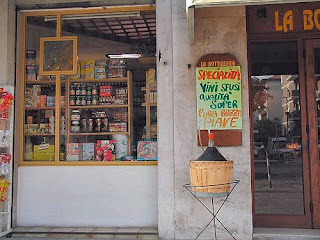 Soave, the Veneto's most widely-distributed white wine, sits on the shelves of most supermarkets and wine stores. 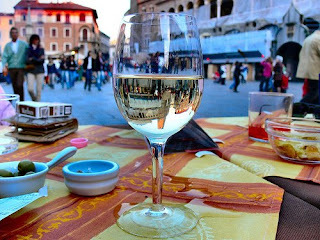 But much of the Soave available in the US is beyond ordinary, made to be drunk very cold on patios under hot summer sunshine. Frankly, I've never been that much of a fan. This is not all there is to Soave, as I discovered lately. Properly made, non-industrial Soave is a far cry from the stuff you might have had in the past. Critics like Eric Asimov have recently been struck by the improving character of these Italian whites--although some find that the changes are not to their taste. Smaller producers are returning to the grape and exploring what it can do if its grown carefully and treated with respect through the winemaking process. I tasted Soave made by a family of winemakers with deep roots in the Veneto--and I'm on Asimov's side in this debate. I tried two of the wines made by the Tessari family, and I enjoyed both of them. 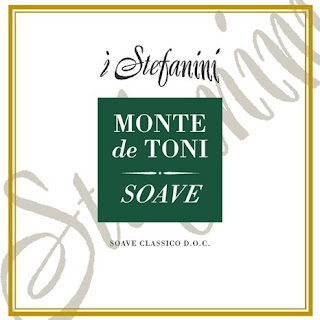 I was absolutely knocked out, however, by the 2006 I Stefanini Soave Classico Monte di Toni (suggested retail $15-$17). This wine had bright, luscious aromas of bitter almond, honeysuckle, and pear. The flavors were an intriguing blend of smoke and honeysuckle, with pears and apples underneath. This wine sees no oak, so the smoke notes come do not come from how the wine was aged. Excellent QPR on one of the best white wines I've had in a long time. I Stefanini makes an entry level wine, too, and it's proof that even a more basic Soave bottling can be excellent. I tried the 2007 I Stefanini Soave Il Selese (suggested retail $11-$13). Faint, fresh aromas of buttery pear and yield to flavors of creamy pear with bitter almond and honey nuances. This wine is very drinkable with a lush, medium-bodied mouthfeel. I suspect this very good QPR wine would appeal especially to Chardonnay drinkers who are ready to try something different. Both wines left me thinking, if this is Soave, what have I been drinking? No matter what the answer is to that question, I know I'll be looking for more white wines from the Veneto and paying attention to how they're made and who makes them because this is proof that they can be excellent and affordable. Full Disclosure: I received these two wines as samples from the importer, Domenico Selections. If you're looking for ideas on what to share with the one you love on February 14, I've got some in this week's Serious Grape column over on Serious Eats. 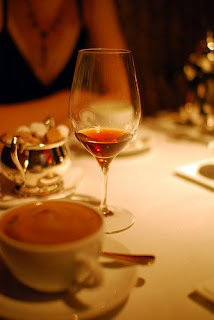 Tasting notes for a few dessert wines I've enjoyed recently--along with some pairing suggestions--are just a click away. After a somewhat bumpy start, the next book up for reading and review in the monthly Wine Book Club is Don and Petie Kladstrup's Champagne: How the World's Most Glamorous Wine Triumphed Over War and Hard Times. (Harper Collins, $13.95; Amazon.com, $5.50). I picked this book for the month of February because more bubbly is consumed in the US between January 1 and February 15 than over the remaining course of the year. I think it's insane the way we think sparkling wine is only to be had at special occasions. This book sheds light on how we got the idea in the first place, and explores the wine region that has produced this famous, coveted beverage through good times and bad. Even though this book examines wine history, I think most people will find it a bit more to their taste than the last book. Sorry--I am a historian! So grab yourself some champagne and get your hands on a copy of this book from your local library or bookshop. Then all you have to do is read along and tell us what you think. I'm also open to suggestions on what to read in upcoming months. We'll be reading Kermit Lynch's Adventures on the Wine Route in March and Jamie Goode's The Science of Wine in April. Possible books I've come up for the summer include Susan Sokol Blosser's At Home in the Vineyard, Ferenc Mate's A Vineyard in Tuscany, and Christy Campbell's The Botanist and the Vintner. Any thoughts? Additional titles? If you post a review of the book on your blog, please do so by Wednesday, February 25 at 5 pm and send me the link via email or be leaving it in the comments section of this post. I promise I'll check back here for it. That way, I'll be able to include your reaction in my wrap-up post on Thursday, February 26. No blog? No worries. You can always leave your thoughts in the comments here. 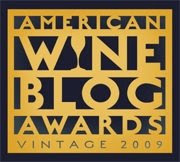 Tom Wark announced the call for nominations for the 2009 American Wine Blog Awards. Nominations close on Sunday, February 8, 2009. After readers make their nominations, a committee of judges will select finalists in each category. Then the readers get to vote among the finalists. Please read the guidelines for each category before you make your nominations. Thanks to Tom for his hard work on these--again. Once again, a new grape has crossed my dinner table. This time it's Tressallier, a grape described by Jancis Robinson in The Oxford Companion to Wine as "a white grape variety grown in the Allier.... It is certainly traditional there, but not unanimously acclaimed nowadays." Oh dear. Talk about damning something with faint praise. With some trepidation I pulled the cork on my 2006 Château Courtinat Tradition Blanc. I purchased it from Garagiste for $13.86, and like most Garagiste wines it's difficult to find, although I think this shop may have the 2007 vintage (I'd check to make sure it's not Ch. Courtinat's red bottling before I ordered it). The wine is made from 70% Tressallier grapes and 30% Chardonnay, and it wowed me. It didn't wow me because it was over-the-top or because it was the best white wine I've ever had, but it did impress me with its pronounced aromas of ripe Bosc pear. The flavors were more tart, full of waxy lemon notes with a bitter aftertaste. The wine tasted fresh and clean and was a nice change of pace from the wash of Chardonnay and Sauvignon Blanc. It was lower in alcohol, too, at 12-12.5% alc./vol. Because of the slightly bitter aftertaste, this wine will be much better with food than without and when you're picking something to pair with it I'd steer towards lemon-inflected poultry or seafood. We had it with a smashing shrimp and goat cheese risotto that included tiny amounts of lemon peel, ginger, and parmesan cheese and the wine was stunning with it. I should warn you that I'm starting to get a serious crush on wines from the Auvergne like this one. Some are designated as wines from the Loire, and others as wines from the Midi. However they're labeled, I think they're fabulous, unpretentious, and delicious wines with great value. So look forward to seeing more reviews of them here. Timed to mark out a period of feasting and revelry before Lent, this year's celebration extends from February 13 to February 24. 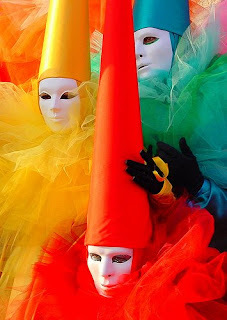 Venice puts on its fanciest costumes, greets thousands of visitors, and wines and dines itself with even more style than usual. To join in the fun, GWU$20 will be exploring the wines of the Veneto in February as the next step in my ongoing effort to drink my way through the regions of Italy. I know that this month's Wine Blogging Wednesday theme is A Passion for Piedmont--but Piedmont is where we'll be heading in March! Vintners from this part of Italy use a number of interesting and unusual grapes to make their wines. Tangy Garganega (the grapes that go into Soave), dark and luscious Corvina, and local favorites like the perfumed Oseleta are just some of the grapes that are either unique to--or prized by--the region's growers and winemakers. But the Veneto is also planted with French and German varieties. Chardonnay, Cabernet Franc, Riesling, and Viognier can all be found in bottles from the Veneto. As always, if you have particular tips for me and other GWU$20 readers--makers you love, grapes you want to know more about--please leave them in the comments below. Recently, I opened up a bottle of the 2004 Bodega Luzdivina Amigo Viñademoya that I purchased a while back. ($13.99, Garagiste; available elsewhere from $7-$18) When I first tasted it, I wasn't that impressed. It was just a simple, rustic red with aromas and flavors of boysenberries and a little bit of earthy funk. Nothing memorable, nothing to spend time writing about. But I corked it with some inert gas, and tried it again a few nights later. This time I paired it with a traditional dish from Rioja: patatas a la Riojana. A cross between a soup and stew, it's full of earthy potatoes, has some spicy kick from the inclusion of chorizo and peppers, and lots of flavor from the garlic and onion. I used Anya von Bremzen's recipe from her fabulous cookbook, The New Spanish Table. Here's a slightly different version that's available online. Wow. What a difference the right food made to this wine. Sipping it along side the soup, with its smoky pimenton and potatoes, made the flavors of boysenberry expand out to include blackberries an cherries. The earthy funk turned into a pleasant background note that kept the wine from becoming too fruity and flat. A wine that I had mixed feelings about was transformed into a good QPR bottle. Wine and food synergy--that moment when you realize the combination of what you're eating and drinking is greater than the sum of its parts--happens all too rarely. When it does, it can result in a memorable meal and make you glad that you gave the wine a second chance.